The outer tie rod end is a greased rotating ball and socket steering component that controls the movement of the front wheels by either pushing or pulling on the wheel knuckle. The wheel knuckle pivots on top and bottom ball joints which are also subject to wear. 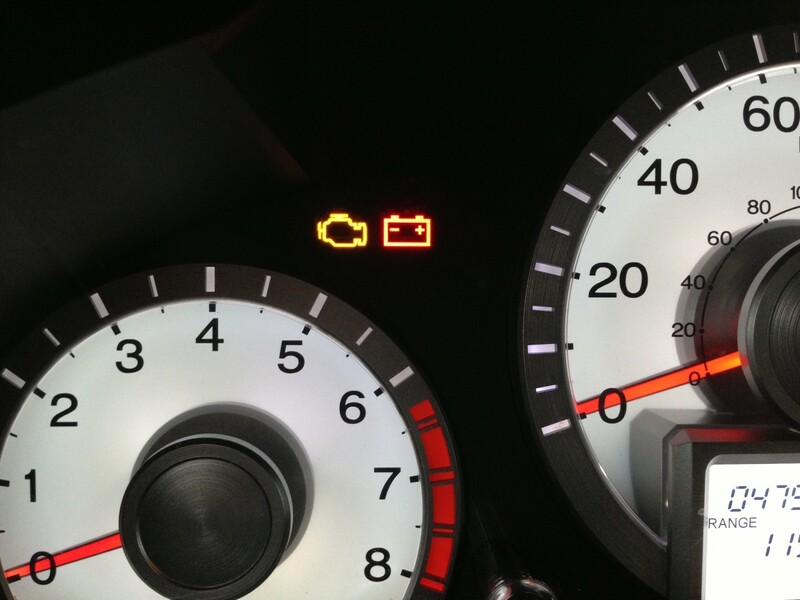 When the tie rod's ball and socket are worn, steering response will get sloppy; too much free play may exist in the steering wheel before the wheel's respond; a wheel alignment cannot be performed; uneven tire wear maybe noticeable; a steering wheel shake or front end vibration may be felt during acceleration. 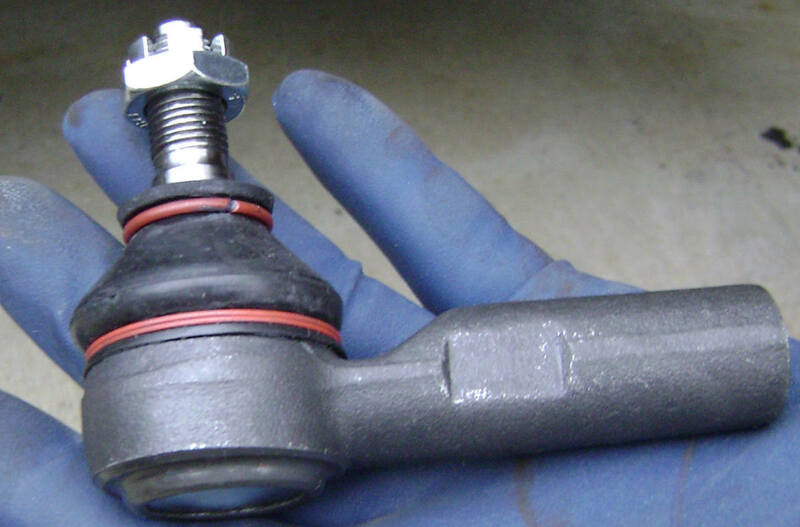 The tie rod's wear may be caused by its dust cover splitting allowing entry of moisture and dirt or the sealed grease has lost its lubricating properties. 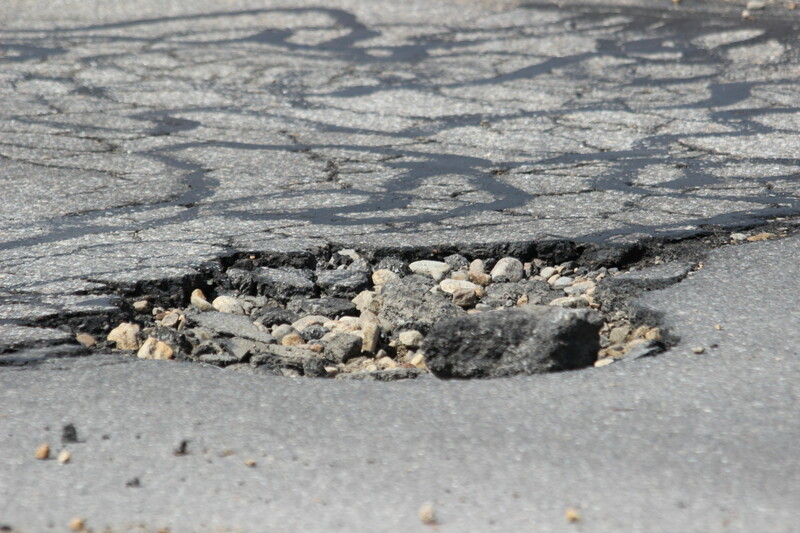 Tie rod end damage or wear can occur when impacting curbs and driving over pot holes and irregular road surfaces . . . so slow down when you see a speed bump! 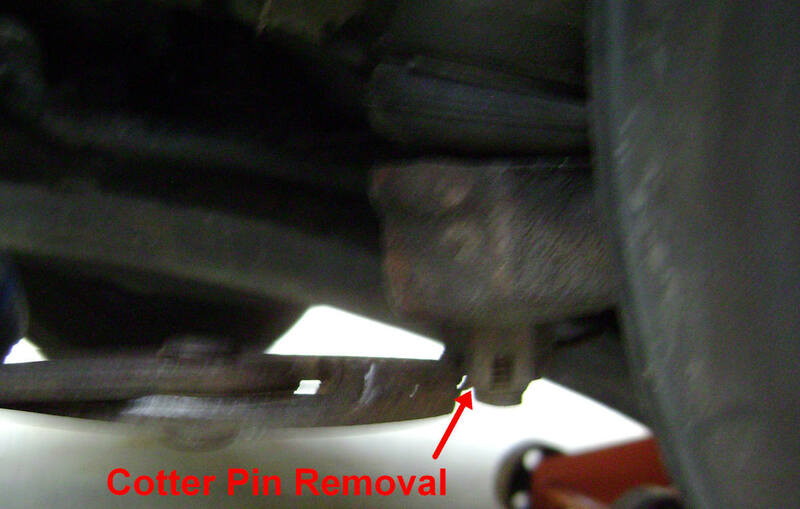 Although high mileage cautiously driven Camry's rarely have tie rod end failures, the toe adjustment needed to set the angle of the wheels may not be possible with worn tie rods during a front end alignment job. 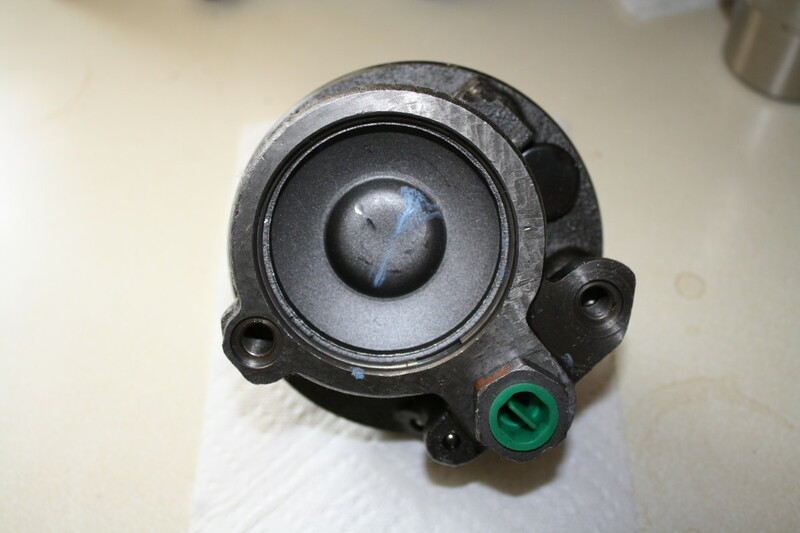 Camrys, as well as other import vehicles, do not have grease fittings to allow re-lubrication of the tie rod's ball-in-socket. 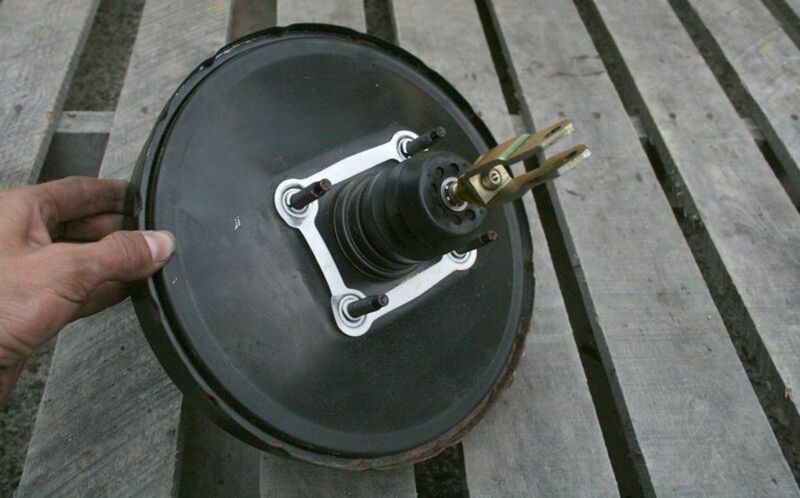 In addition, the rubber boot that seals in the grease may dry root and split exposing the tie rod joint to dirt and moisture which will accelerate wear. As a general rule, the steering wheel should not allow more than 1/8 inch free play before the wheels respond. 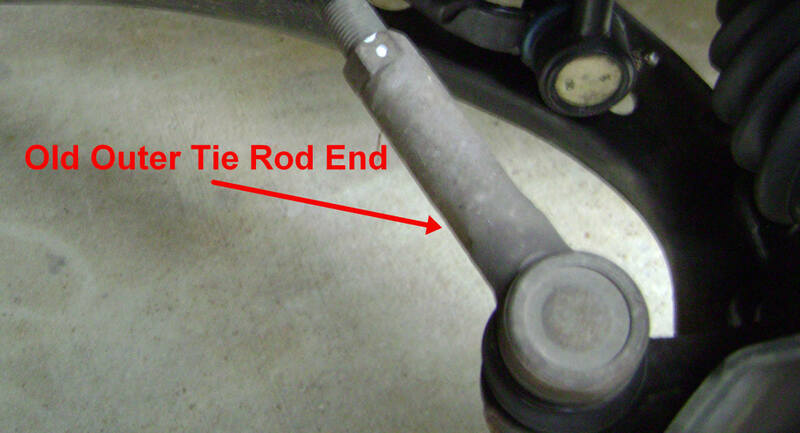 Lastly, worn tie rods will accelerate tire wear. 1. Remove the tire to expose the tie rod. Support the car with a jack stand. 2. Apply paint marks to the top of the inner tie rod and the jam nut. 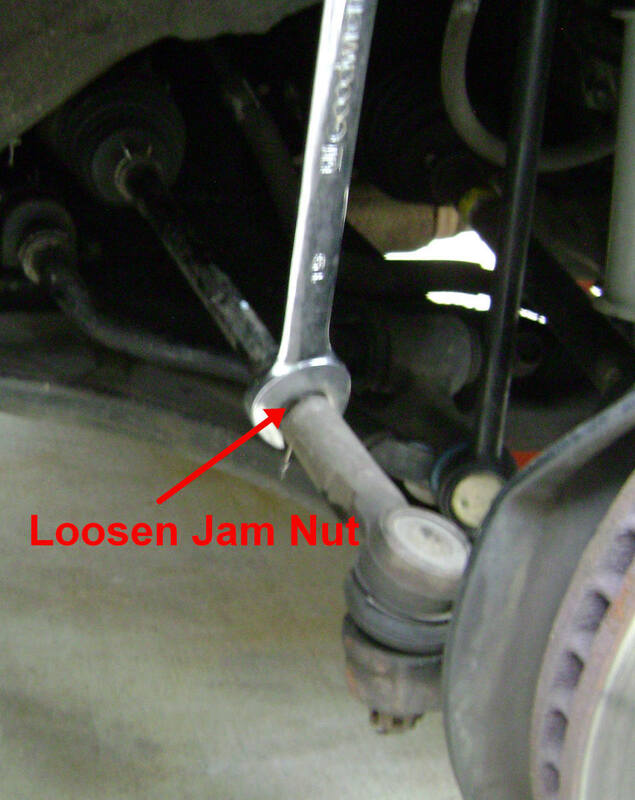 When loosening the jam nut, the inner tie rod will more than likely rotate with the nut. The inner tie rod can be rotated back in place with a 14mm open end wrench while holding the jam nut in place with a 19mm wrench. 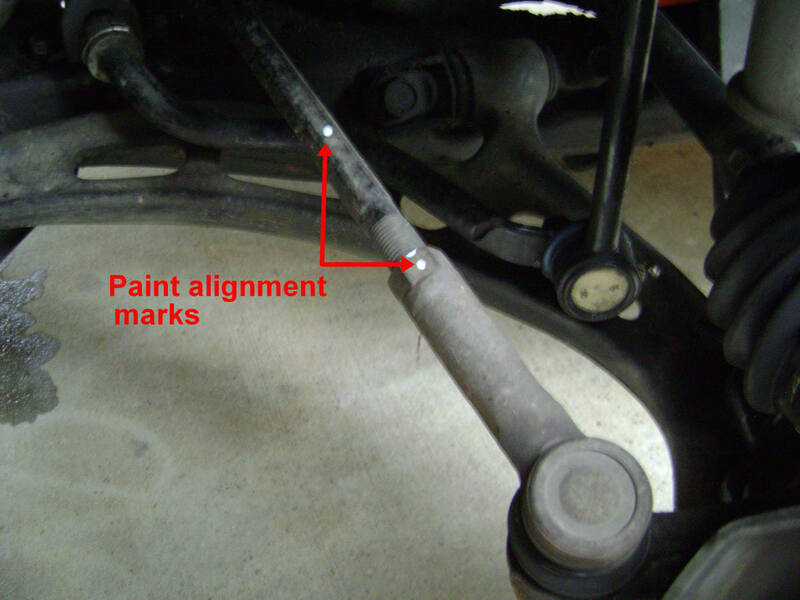 The paint marks will help you bring the inner tie rod back to its original position after the jam nut has been loosened. 3. Loosen the jam nut on the tie rod end with a 19mm open end wrench. This is to allow removal of the old tie rod end when detached from the steering knuckle. 4. 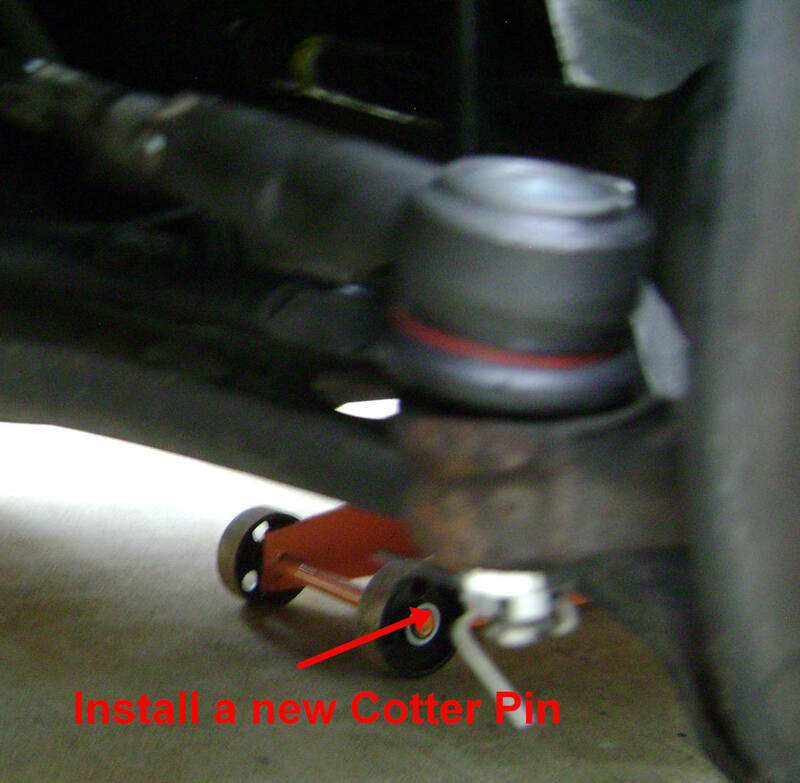 Remove the cotter pin from the tie rod end and spin loose the castle nut until it reaches the peak of the threads. This will allow the old tie rod to partially disconnect from the steering knuckle but not drop away. 5. 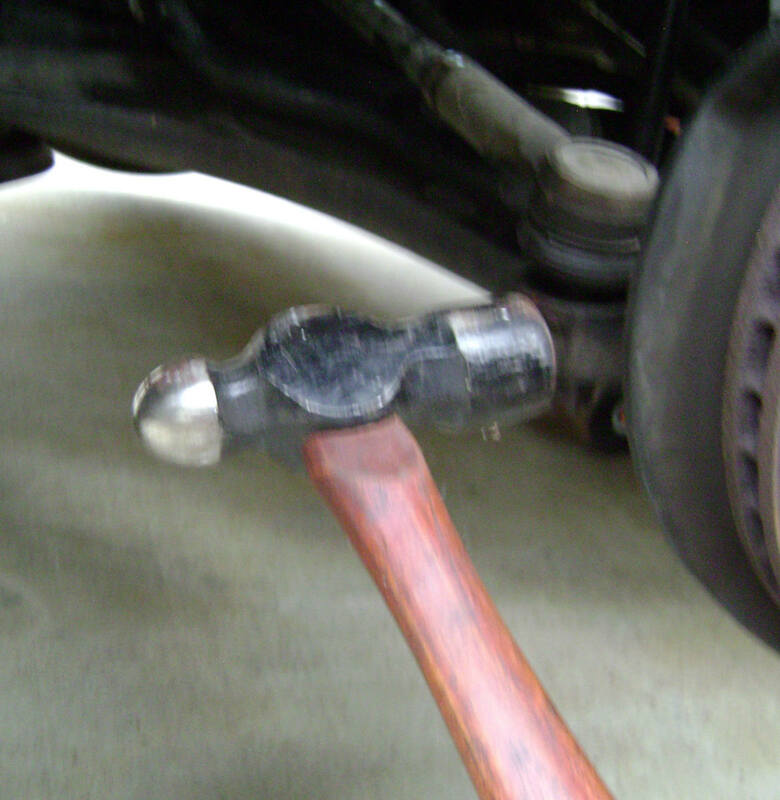 With a ball peen hammer, smack the side of the steering knuckle that surrounds the tie rod spindle to "shock" the spindle loose from the steering knuckle. A few smart impacts should free it loose. 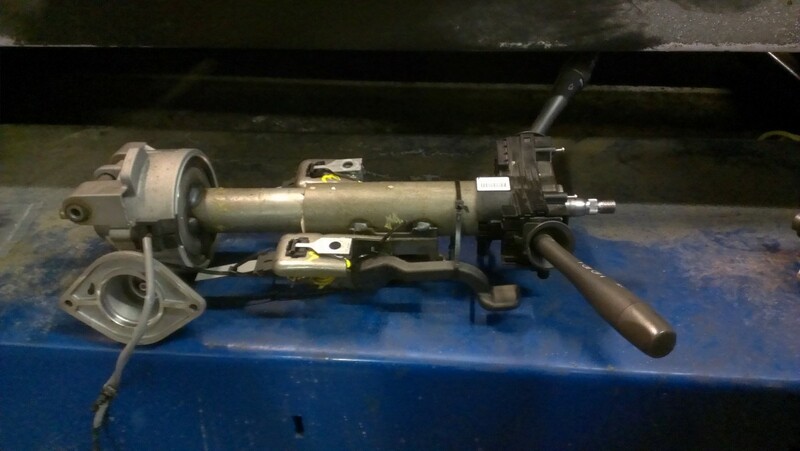 If this does not work or you do not feel comfortable doing this, a universal ball joint separation tool can be used. 6. 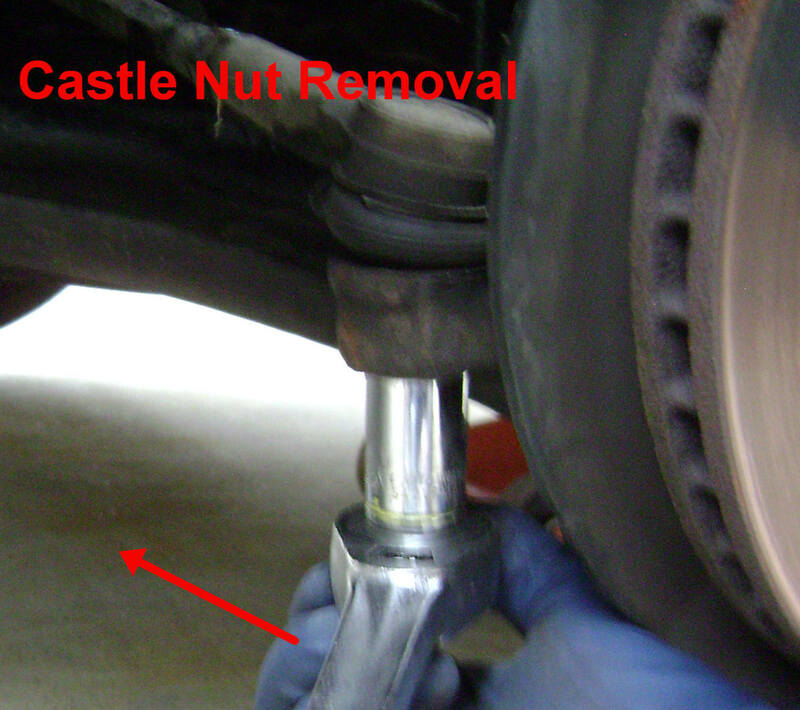 Remove the castle nut, separate it from the steering knuckle and twist off the tie rod end from the inner rod. Keep a count on the number of turns for installation of the new tie rod. 7. Measure and compare the length of the old tie rod with the new tie rod. The measurement should be taken from the threaded end to the center of the tie rod Spindle. 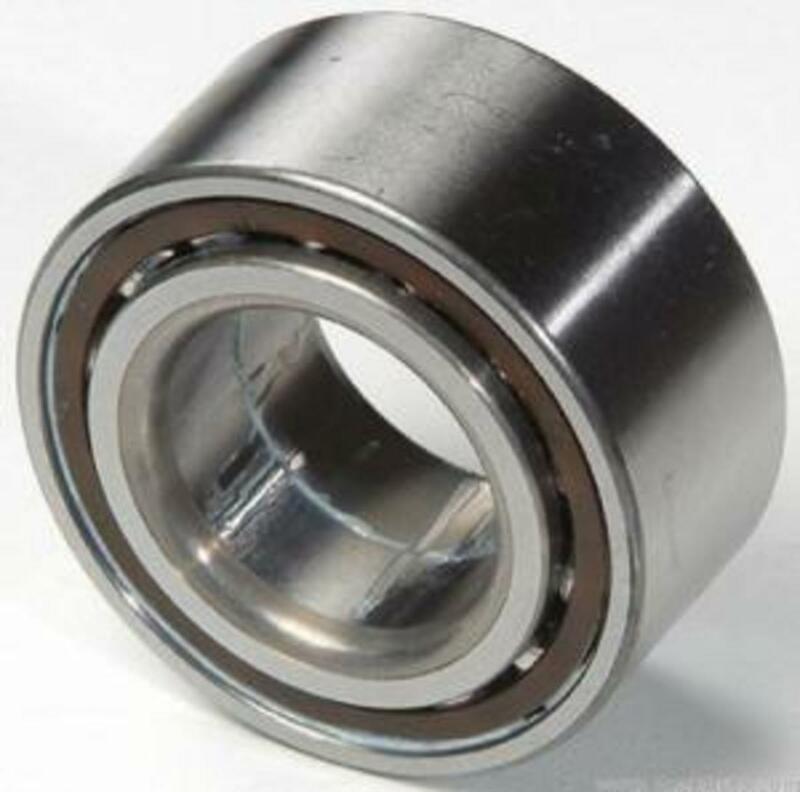 If there is a difference, that difference must be added or subtracted from the inner rod jam nut. In most instances, the replacement is usually of the same length. 8. 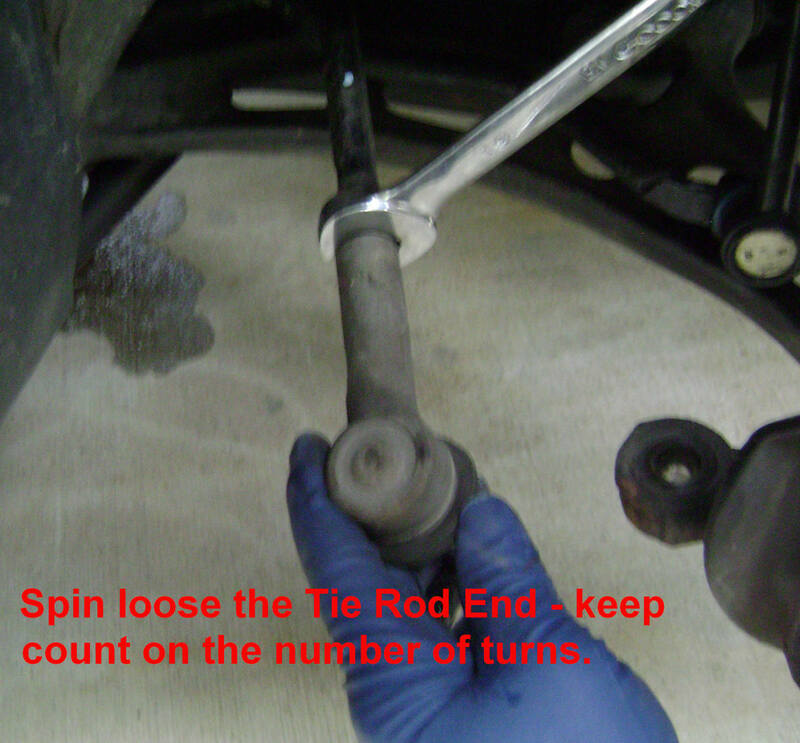 Spin on the new tie rod using the number of turns counted from removing the old tie rod. If perfect, the jam nut should not take more than 1/8 turn to secure the nut. If the length of the new tie rod is different, add or subtract the length. 9. 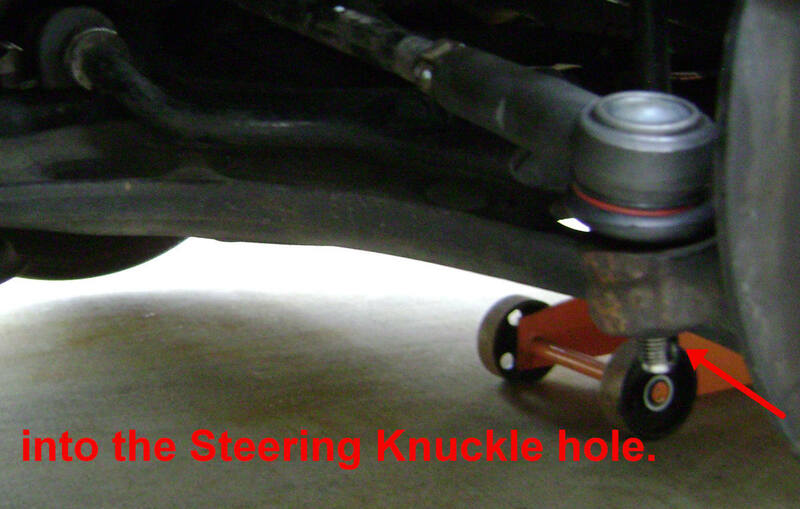 Position the tie rod end into the steering knuckle, spin on and torque down the new castle nut. Warning: Over-torquing will strip the threads of the castle nut. Using a torque wrench is recommended if unsure as to the appropriate tension; then apply enough torque to align the castle nut opening with the tie rod spindle hole for the new cotter pin. DO NOT LOOSEN for hole alignment. 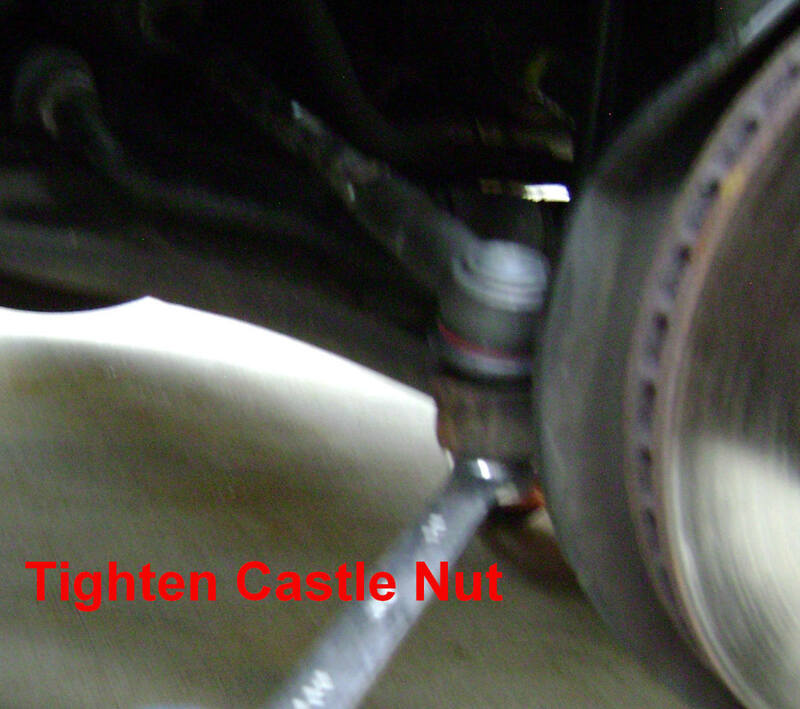 The tightening of the castle nut will press fit in the tie rod into the steering knuckle. 10. If the new tie rod end comes with a grease fitting, screw on the new fitting, torque down and lubricate with a grease gun. It is recommend that grease with Molybdenum disulfide (Moly) is contained in the grease. 11. Twist the inner tie rod until the paint mark is pointing up. While keeping the Inner tie rod from moving with a 14mm open end wrench, use a 19mm open end wrench to secure the jam nut onto the new outer tie rod end. Consider having a wheel alignment to ensure the toe-in setting is correct. Probably rust buildup on the inner tie rod threads. Two methods of removal can be used: 1. Apply penetrating oil on the inner tie rod threads and let sit overnight before trying again. 2. Or using a propane torch, apply heat to the outer tie rod until almost red hot, then try to remove. 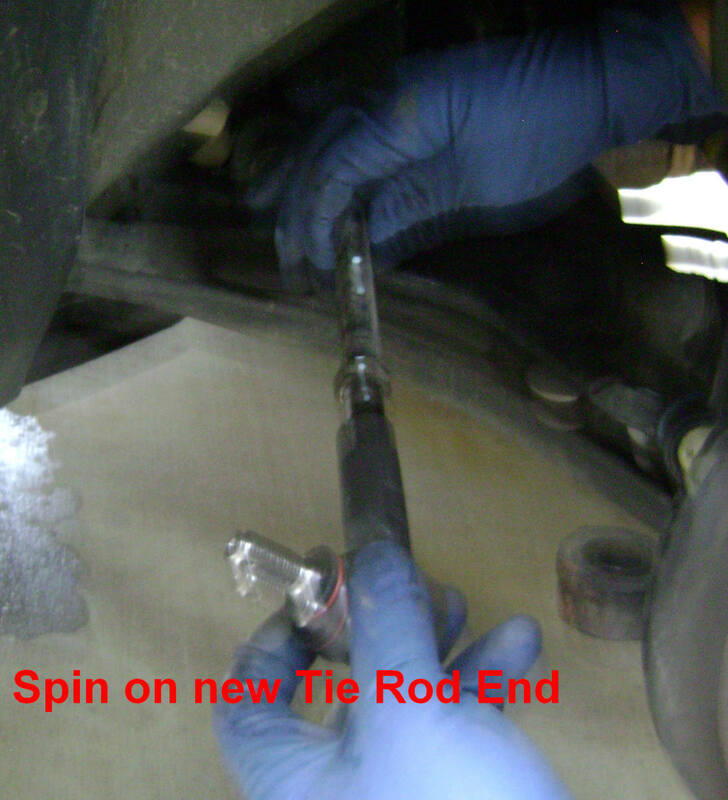 I am trying to get the outer tie rod end off but the inner tie rod is spinning so I can't spin the outer tie rod off. I've already got the jam nut loose. I've tried a pipe wrench on the inner tie rod and with a 19mm wrench on the outer tie rod but still can't get the outer tie rod to budge. Do you have any suggestions? 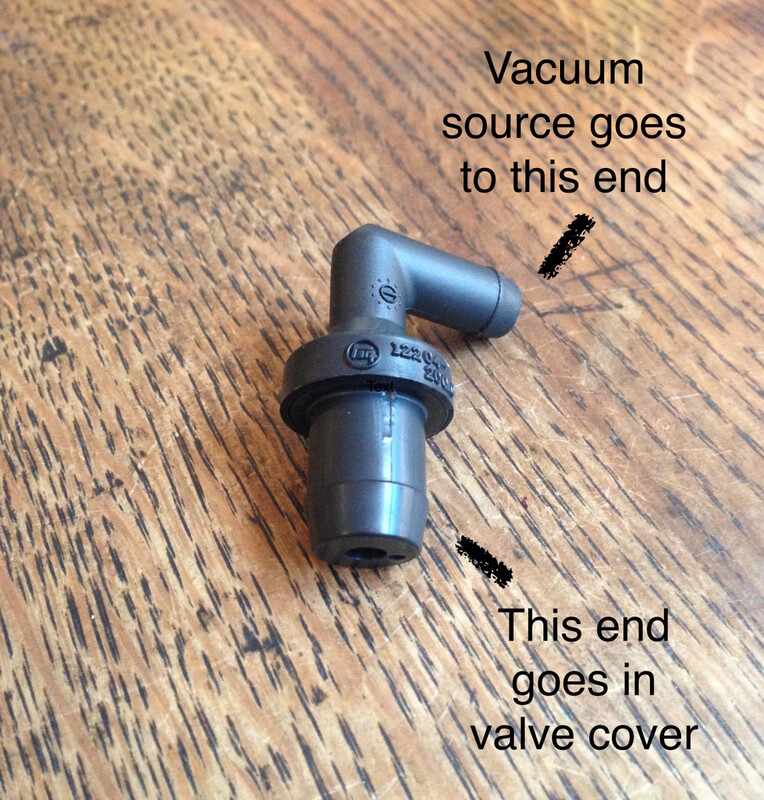 You can use a 'crows foot' adapter instead of a socket for your torque wrench. The paint marks won't be exact since the replacement outer tie rod end may be slightly different. Always good to get a wheel alignment if you want it to be absolutely exact. What torque wrench will fit to tighten the jam nut to 54ftlbs, the one I have is long and hits the ground, body, or suspension. Also it only uses sockets. I used a 13mm on the flat part of the tie rod itself (93 Corolla) but the wrench didn't hold so I used a pipe wrench instead. I tapped on the outer tie rod end while trying to loosen it which helped a lot. I noticed your paint mark on the jam nut moved a little more counterclockwise as did mine, after about 16.5-17 turns to the end itself. Inner tie rods rarely need replacement unless damaged or the boot has broken exposing the inner tie rod to dirt and moisture. Hi hardlymoving! I've seen people talk about the outter tie rods but not the inner ones, would you please tell me why? My Toyota Camry 94 has 176k miles and still using the original tie rods, there are play in the steering, should I replace it even though I don't find any signs of any damage from the rubber boot? Your suggestion would be very much appreciated. 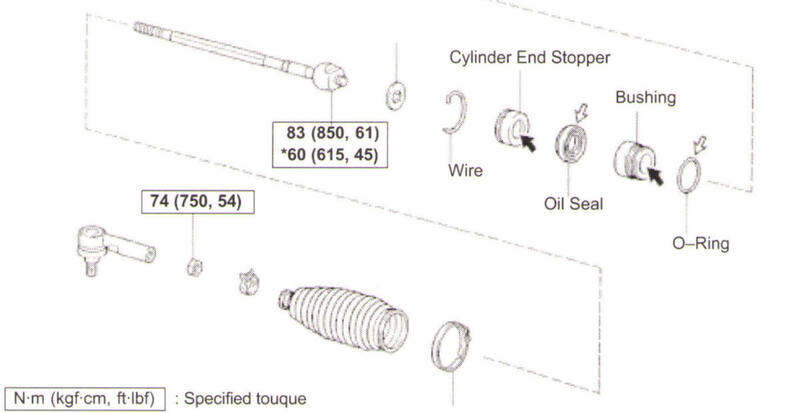 The asterisk indicates the torque setting when using a Toyota SST (Special Service Tool). 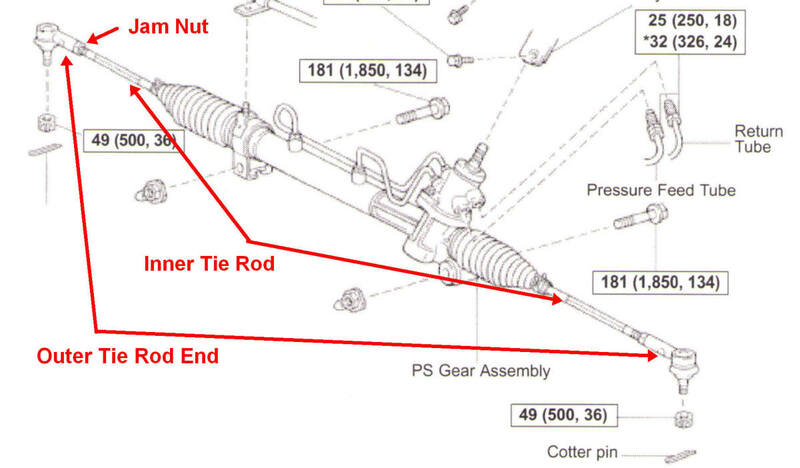 In the tie rod diagram it lists two torque specs for the inner tie rod, one with an asterisk. Do you know what the asterisk indicates? Also, what year is this diagram for? I'm working on a 99... do you know if this spec would apply? Thanks!